Looking for the Ultimate Girls Trip Experience? 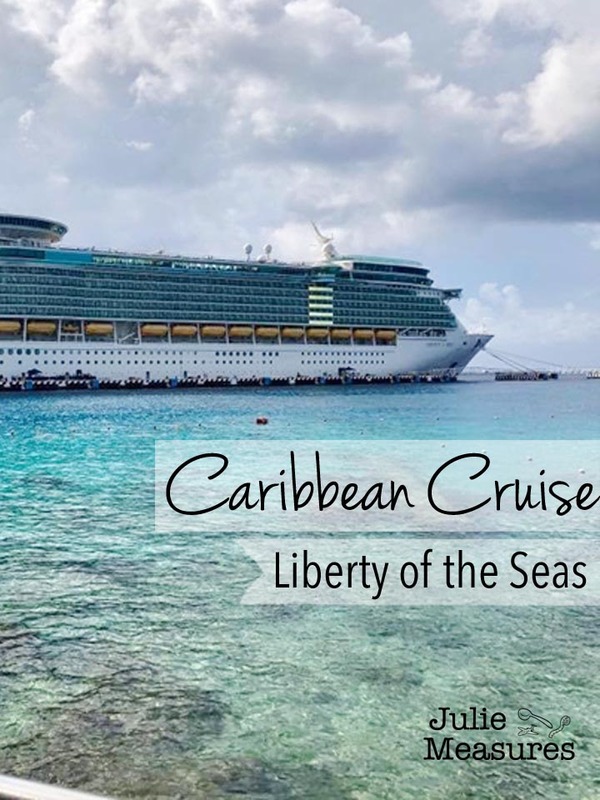 You’ll find it aboard a Caribbean Cruise! Head to the seas for more fun than you thought possible. How do you get eight women to go on a week-long girls trip together? 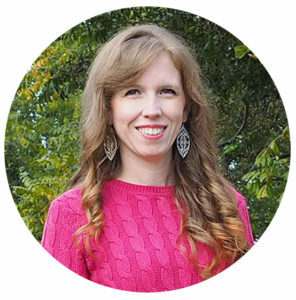 You book a cruise! Eight women, seven nights, 3 countries, and too many laughs, hours by the pool, and dessert plates to count. No matter what your group of girl-friends like to do you can find it on a cruise ship. Like to eat? Get ready for steak, lobster, crème brûlée, cheesecake, and just about anything else your heart might desire. Looking to dance the night away? There is a dance club. Like shows? They’ve got Broadway entertainment and more. Want adventure? Check. Shopping? They have that, too. Movies on the big screen? Every day. Let’s start with dining, shall we? I don’t know about your group of friends, but mine like to eat. Check out that dining chandelier? I mean, seriously. Our cruise ship offered a multitude of dining options. Need to grab something quick so you can head to your next activity? The buffet was open from early morning to late in the evening, with short closures to swap breakfast for lunch and then lunch to dinner. Most days we chose to eat lunch in the buffet because it was quick and easy. Want to be dazzled with three course dinners every night? Make reservations to eat in the dining room. Our seating assignment was on the bottom of the three floor dining room. With a group of 8 we reserved the same time each night and got to be sat at the same table each night. Every night our amazing servers would bring us our menus where we could peruse that nights offerings. Some menu items are offered each night, but several of them changed. I got some great advice the first night, pick things you normally wouldn’t try at a restaurant. On your cruise if you don’t like your choice they can bring you something else! This is a no-risk opportunity to try something new. I enjoyed lobster tail, shrimp, lobster bisque (I really like seafood), steak, lasagna, and so many more main entree delights. Desserts included crème brûlée, cheesecake, chocolate lava cakes, tres leches, and others. Pro Tip: You can order more than one of each course! I knew we were really winning at life the night I realized that at our table of 8 we had 13 dessert plates. 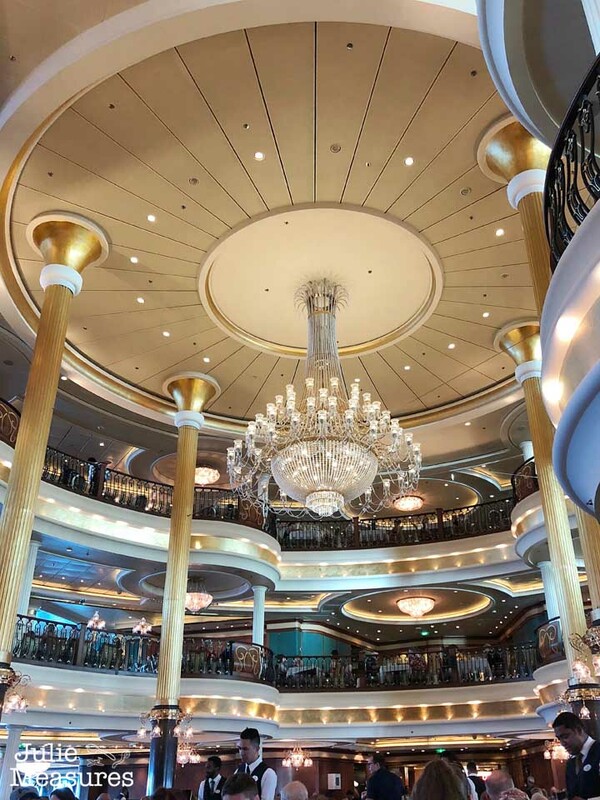 Everything in the main dining room was included in our cruise, no specialty dining required. Is there a Broadway musical you have been wanting to see? You might be able to catch it on your cruise. 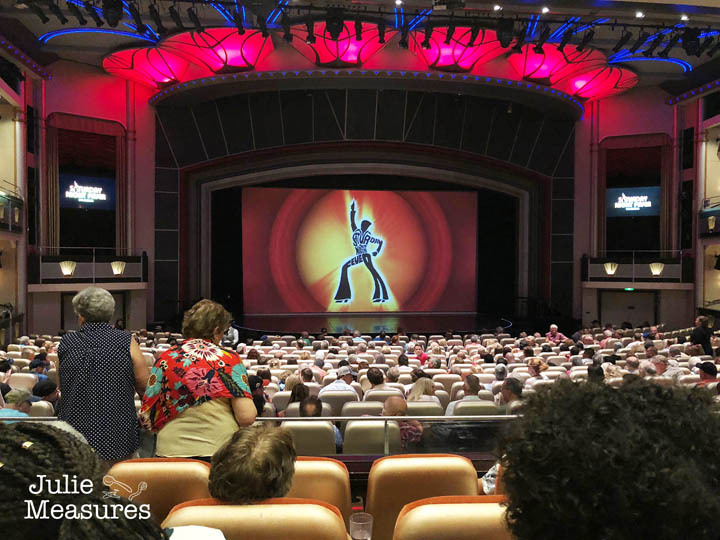 On our cruise we saw a performance of Saturday Night Fever. For those die-hard musical lovers, the performances on the ship are condensed, ours was a 90 minute show. But musicals aren’t the only entertainment you will find in the theater! My favorite show was In the Air, an acrobatics Cirque du Soleil-style show. Beyond performances we enjoyed both music and movie trivia competitions. We did better at Game of Thrones than Harry Potter, and finishing the lyrics of songs is harder than you think. There was an ice skating show, karaoke nights, and movies by the pool every day. Ever wanted to watch Jaws on a ship? We did that! On big screen while sitting in the hot tub. They showed new releases, too (including Avengers). The movies would get an afternoon showing and then again in the evening. Pro Tip: Every evening we would get a handout with a list of the next days activities. Particularly in a big group not everyone wants to do every activity. We could talk about what we wanted to do as a group and then if smaller groups wanted to do other activities they could plan those. We would stick our plans on our doors with sticky notes so we would be able to find each other around the ship. If you’re ready to get your heart pounding a little bit, or sneak in a fun workout, give the rock climbing wall a try! 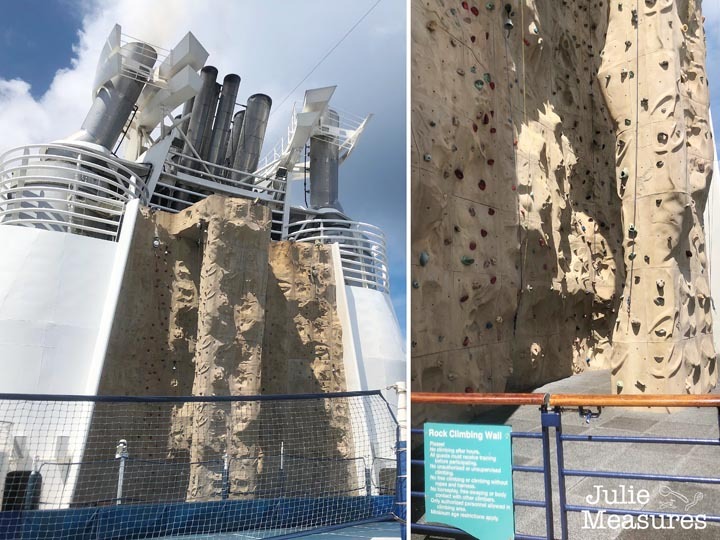 Even if you’ve done rock climbing before I’m not sure it can rival doing it on top of a cruise ship. You’ll need a pair of socks for this activity, and we all had to sign a waiver, but it was a really fun group activity! Plus, it’s something else that’s already included in your cruise. If rock climbing is a little more adventure than you want, our ship also had multiple water slides, and 3 pools. 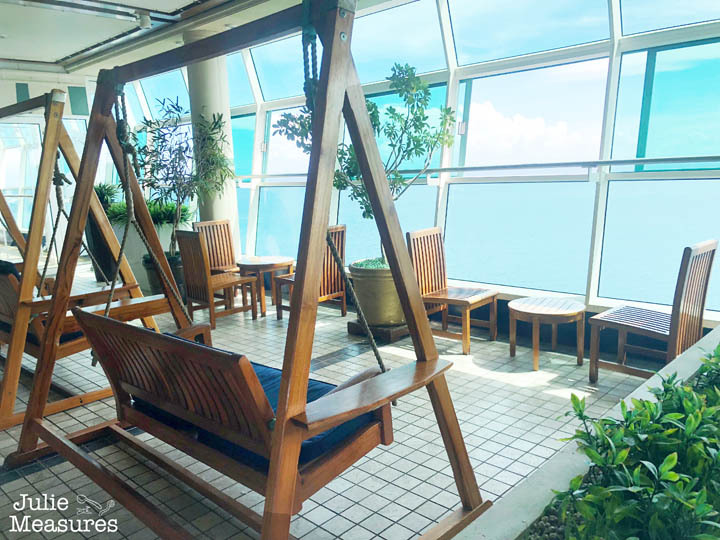 Plus a fitness area, jogging track, ping-pong tables, and even a miniature golf course. 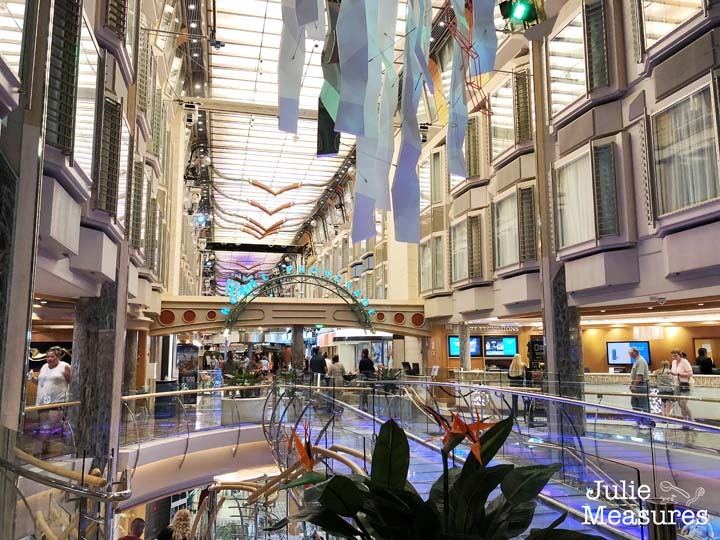 Yes, that shopping strip is inside the cruise ship. Deck 5 to be exact. Forgot your water shoes for your excursion? Pick up a pair. More than one person in our group picked up a new hat. Handbags, jewelry, clothes, watches and more are all available for perusal. I did notice that on the last full day on the ship that many of the items were deeply discounted. You never even need to step off the ship to purchase your souvenirs. Forgot to bring a book to enjoy by the pool? Our ship even offered it’s own small library. Here passengers could pick out a new book to read (or donate the one that they finished). For vacations I usually prefer to read books on my tablet or phone, so I had several downloaded before the trip. But there are also some comfy chairs if you wanted a place indoors to read. Me, I preferred to do my reading by the pool. While it might have been over-protective I made sure to keep my phone in a water-proof case when reading by the pool. You just never know. 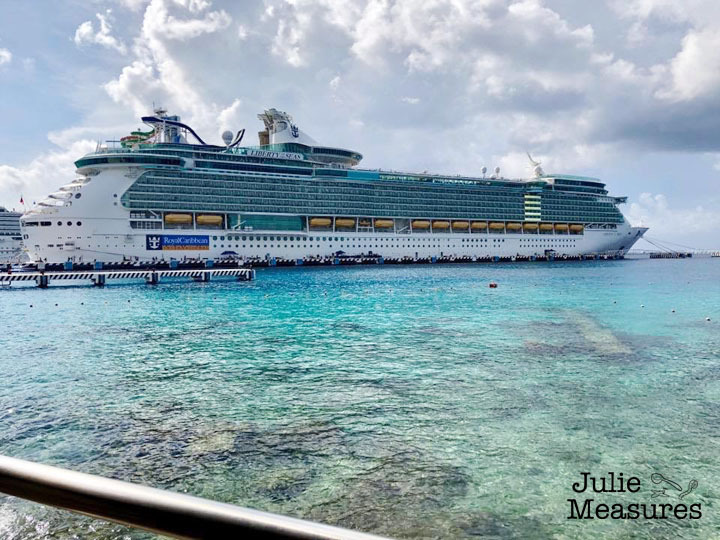 There isn’t a shortage of terrific photo opps on board a cruise ship. 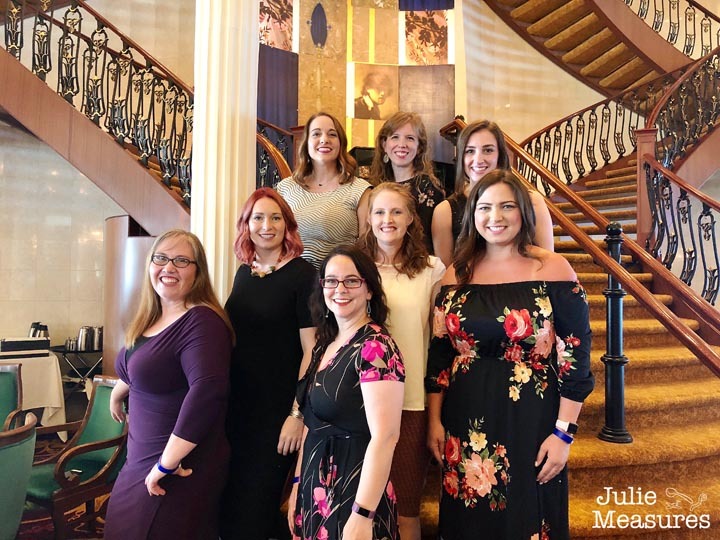 There are the formal pictures that the on-board photographers take, from individual shots taken at dinner to group pictures on the cruise formal nights. But there are so many chances for informal pictures as well. 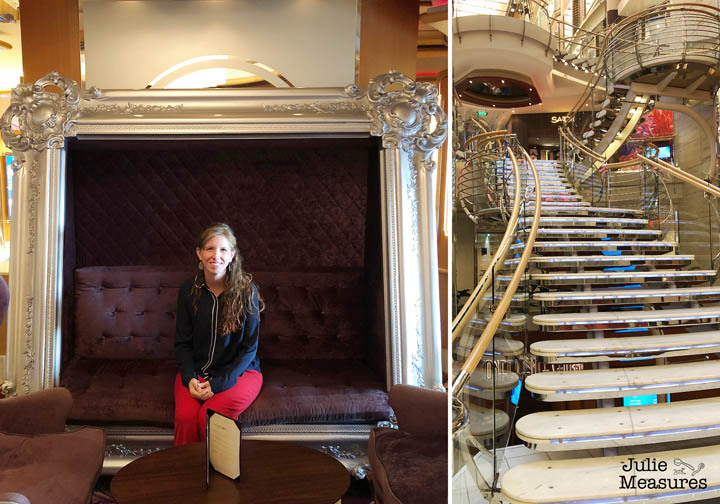 Is there anything more iconic than a photo on a cruise ship staircase? I don’t think so. This photo frame couch was in one of the public areas on the ship, and almost un-noticable until you saw someone else take a photo on it. 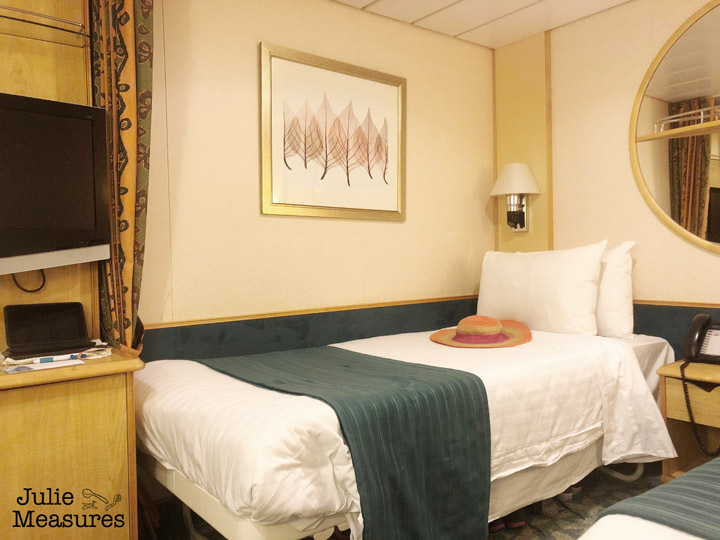 Not all cruise ship photos need to be glamorous, you’ll find some hilarious photo opps walking past other rooms. 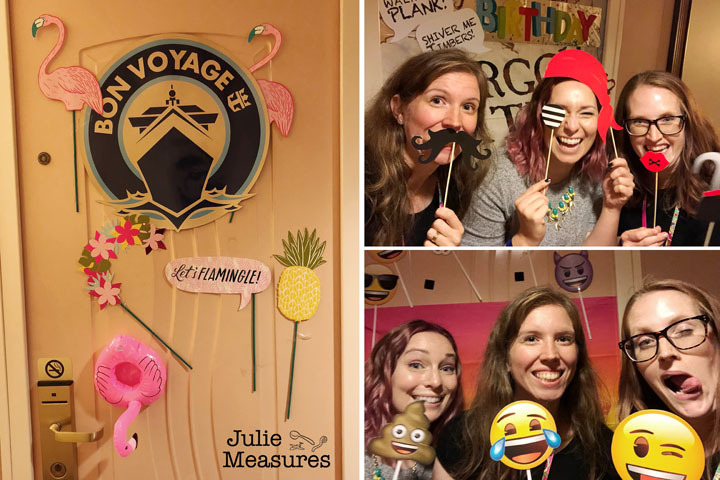 One evening after dinner we found all of these fun doors with various photo props from flamingos, to emojis, and finally pirates. Bring your phone with you to take lots of silly group photos. And if you want to be part of the fun, pick a theme and decorate your door. 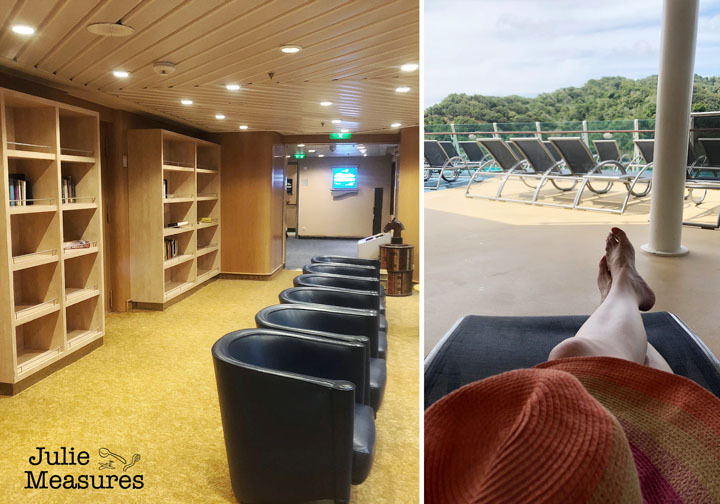 One of the best things about a cruise is that everything is taken care of for you! Stay up late, sleep in, and soak up a truly relaxing vacation. Next learn what to pack for your cruise and how to have fun on your cruise, no excursions needed!